Redwood City, CA, November 20, 2014 — Workboard, a provider of leadership and management productivity applications, today announced general availability of an Android version of their popular goal achievement application for enterprise teams. 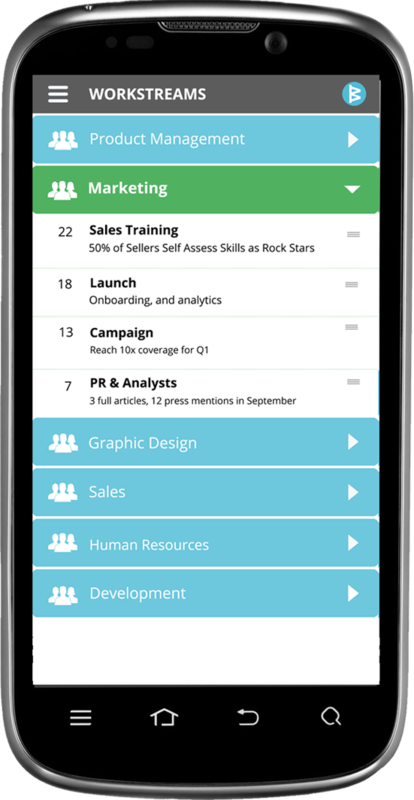 The Android app provides an easy way for managers and directors to set goals, engage their teams in achievement, respond to shifting priorities, delegate and coordinate work, give better feedback and automate status reports and scorecards. Workboard links an employee’s “to do” list with their team’s priorities and business goals. It ensures teams are always aligned on goals and everyone has execution transparency. For many managers and teams, it’s difficult to keep day-to-day work aligned with ever-changing work priorities and still meet long-range goals, particularly when the team and leadership are not in one location. Meetings, status reports, PowerPoint dashboards, SharePoint sites, endless email chains and Excel lists are used to fill the alignment gap, but are often slow and perform poorly. Priorities dashboard: Share the big picture with weekly, monthly and quarterly objectives, and review the real-time status of your work and your team’s progress towards achieving its goals. Give feedback: Check in with your team, provide qualitative feedback or give a badge to offer long-lasting recognition. Notifications: Get instant, actionable alerts when others complete items you’ve delegated, comment on your work, assign an action to you, or add attachments. Ping: With one click, send a “ping” to your team to get updates on the status of an action item. Teams at Bloomin’ Brands, Daikin Applied, IBM, Sheraton, Oracle, NBC and hundreds of other companies use Workboard to set and achieve their goals week after week. Like Workboard’s Team Velocity web app, the Android app is free for teams of any size and is instantly usable. The Android app for Workboard is available from the Android store or it can be found by visiting http://www.workboard.com/mobile. Founded in 2014, Workboard, Inc. is a venture-backed provider of leadership and team productivity applications that enable managers to better engage their teams in achieving goals. The company was co-founded by CEO and serial entrepreneur Deidre Paknad. The free Workboard app helps teams share goals, action items, and feedback while automating weekly status reports and dashboards. Teams at hundreds of organizations rely on Workboard including large pharmaceutical, financial, technology, oil and manufacturing companies. For more information, visit www.workboard.com. Workboard's free productivity app for Android users.